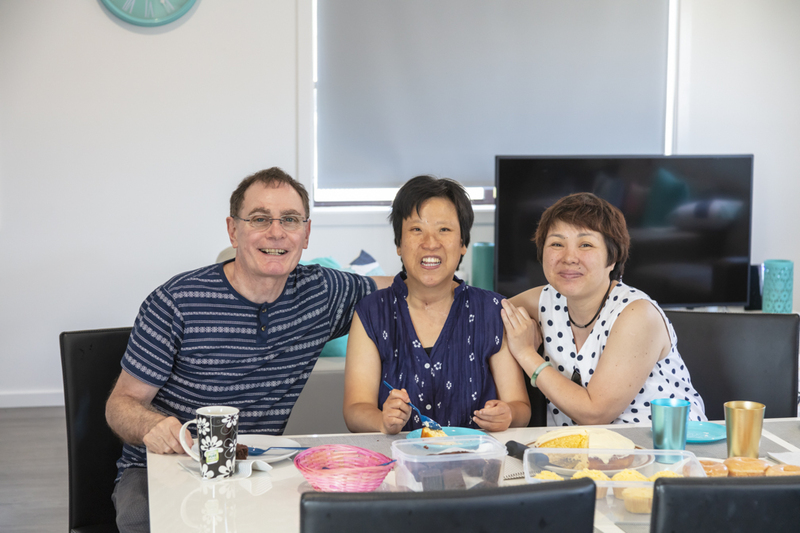 There’s been a thrill of excitement as shared living residents Sharon, Kim, Nicole and Renee settled into their recently refurbished new home that has been designed to suit their needs. Located in Toukley on the Central Coast, residents are within walking distance of shops, cafes and a short drive to the beach. The home is fully accessible and features four large bedrooms, two living areas, shared dining areas within furniture kindly donated by Clayton Utz and a spacious backyard with a new BBQ kindly donated by Bunnings. For three of the residents it is their first time in a shared living home, and the ladies have already formed a close bond as friends and house mates. They’ve been exploring the community with outings to bowling and visiting the local shops. Each week they enjoy cooking together to make dinner and have already set in place planning their weekly meals, with Nicole in charge of the weekly shopping list and getting the groceries. “I am happy, I like my room.” Renee. To celebrate their new home, Sharon, Kim, Nicole and Renee were very proud to host a family BBQ, surrounded by family, friends and staff. It was a wonderful day spent chatting and catching up, sharing a meal together and having a few laughs. “Thank you for all your support and help and for making things seamless, we really do appreciate it.” said Corrie, Sharon’s Mum.